The North Shore’s Best Catering Team! Drawing from the diverse menus of our three Salem, MA restaurant kitchens, we are prepared to cater any event you throw our way. We used 3 Kitchens Catering for our wedding. The food itself was great. We stuck mostly to bbq and I’m still having people tell me how good the brisket was over a month later. The cornbread was awesome. My (and others, apparently) personal favorite were the pigs in a blanket. Lauren got her start in the restaurant business at an early age. She quickly moved up the ranks and landed a management position at Uno Chicago Grill in Kenmore Sq. She moved out of her operational role into a more sales oriented role at Salvatore’s restaurants, running the catering division for all five Boston area restaurants. After taking a break to have her son in 2014, she took on a position with Fireside Catering managing large weddings and social events on the North Shore. She found her way to Smokin’ Betty’s last summer as a consultant and took over as the Director of Catering right before having her second son in December. She is a food enthusiast and dedicated to meeting all the needs of her clients. Joe has over a decade of catering and kitchen experience. His passion for food comes from strong family ties and a love for how food brings people together. Having grown up in small town catering and hotels, he moved to Boston and worked with Clover Food Labs as the Executive Chef's assistant in 2012. He grew into a supervisor roll and spent three years working in the high scale production Kitchen. Moving to SODEXO at the Federal Reserve in Downtown Boston as a Rounds Cook, he worked extensively with the high end dining hall and Banquets events team. In 2018 he became a rounds cook at Osteria Posto in Waltham, Ma and shortly later became the Banquets Chef. Joe has been the co-Head chef of his family owned Catering company - Pellegrino Catering, in Somers CT, and now joins us as our Executive chef here at 3 Kitchens. Steve has worked in restaurants for most of his life. After getting his MBA from Northeastern in 2003 he caught the entrepreneurial bug, wrote a business plan, and opened his first restaurant in 2005. 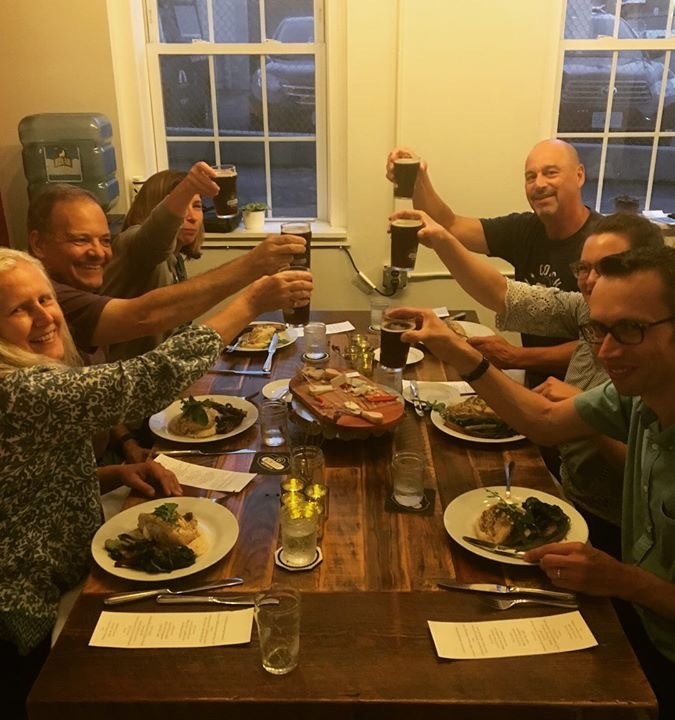 He and his wife Marie are the proud owners of Gulu-Gulu Cafe, Smokin' Betty’s BBQ, Flying Saucer Pizza Company, and now 3 Kitchens Catering, all located in Salem Massachusetts. They have an amazing 6 year old daughter Mina and a couple short faced snorty dogs named Charlie and Rosie Pickle. They snore. All of them.